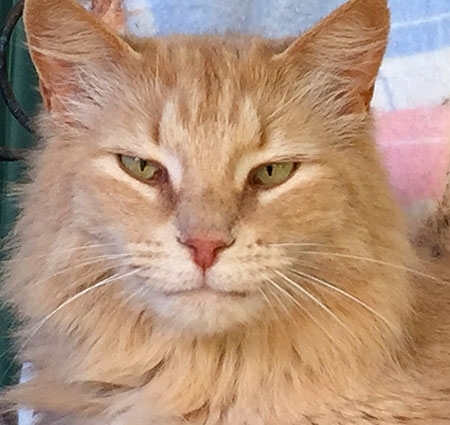 Jamie came to us through a TNR effort in Austin. Animal Control had asked us to help a Section 8 development where kids had been arrested for setting fire to cats. The development was overrun with cats and the best solution was to work with the property manager and tenants to get all ferals fixed (and possibly relocated), kittens into foster, and adoptable strays into an adoption program. Jamie didn't fall into any of those categories. Jamie was an older kitten who was semi-feral. He was deemed unadoptable by the shelter and not accepted into their adoption program. He came to the sanctuary in hopes of being socialized, but he would never socialize enough to be accepted so he became a permanent resident. Jamie became a gentle soul who loved everyone and was quite a snuggle bug. 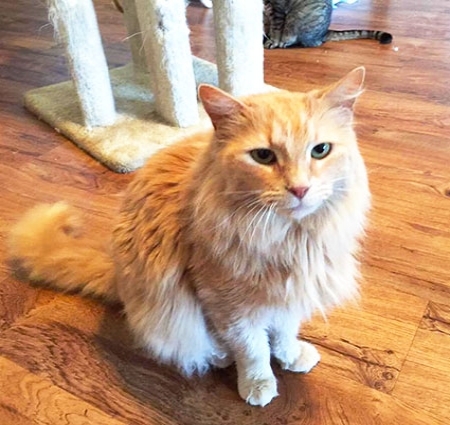 Jamie was a handsome long-haired cat who had the most gorgeous mane in the winter. Rest in peace sweet Jamie...we love you and miss you very much.